I, like many fashion-obsessives not blessed with a giant trust fund, am guilty of once purchasing a fake Louis Vuitton purse at a sketchy shop on Canal Street when I was about 14 years old. Although I am staunchly against the sale of knock-offs now that I'm a full-grown adult, I can understand their appeal to someone who can't drop a ton of cash on a purse. And apparently advertisers understand it too, because Facebook is chalk full of ads for fake luxury items. According to Bloomberg's Daniele Lepido, Andrea Stroppa and Agostino Specchiarello, "two Italian cyber-security experts" discovered that approximately one quarter of the luxury fashion advertisements on Facebook are "linked to bogus e-commerce sites registered by Chinese front companies." So that flashy designer purse showing up in your newsfeed for a fraction of the actual retail price? Yeah, it's definitely not legit. 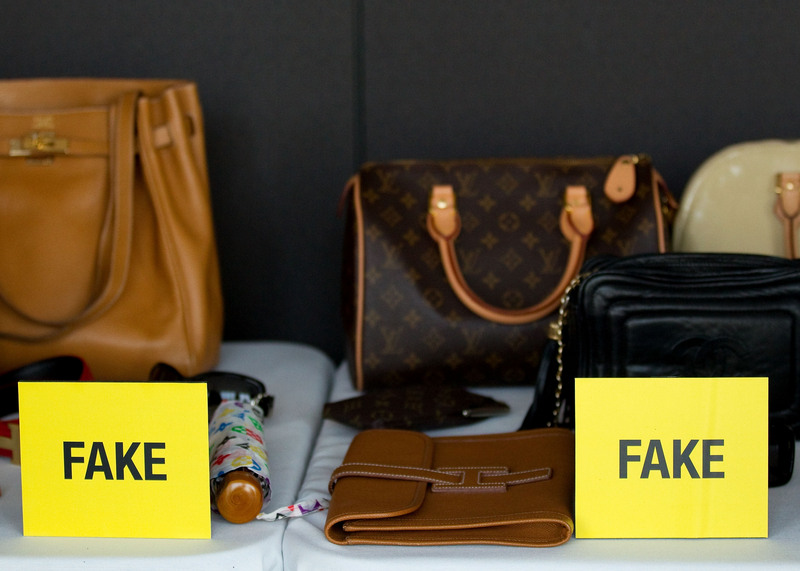 Although it might be fun to snag those LV's for a few (OK, many) hundred dollars less than an original will run you, buying counterfeit goods is ultimately damaging to the businesses and designers who create the products you're so desperate to own. A research paper published through Linnaeus University called "The Affects of Counterfeit Products on Luxury Brands," found that "[t]he consumers' perception of counterfeit products have a negative effect on the consumer perception of luxury brands," perhaps due to the fact that knock-offs are traditionally of poor quality (shocking, I know). The worst part about these Facebook ads is how convincing they are — enough so that excited customers might not even realize what they're getting is fake. Lepido writes, "Websites that sell counterfeit goods often look very similar to the real thing. For example, a rather convincing knockoff Ray-Ban storefront includes the brand name in the Web address, designs and logos resembling Ray-Ban.com, and information about nonexistent warranties, according to the researchers." Ugh. Maybe this doesn't sound like a huge problem to you, but imagine if you were an independent designer peddling your homemade items on Etsy and some big chain came along and stole your ideas, as Urban Outfitters has been accused of several times. You'd be pretty pissed. Counterfeit designer goods are like the reverse of that. Just because Karl Lagerfeld is wealthy doesn't mean his hard work should be used to profit someone else. Luckily, Facebook is working to put a stop to the appearance of illegal advertisements on their site. A spokesperson for the company wrote to Bloomberg, saying: "We prohibit fraudulent or misleading claims or content, and to enforce our terms and policies, we have invested significant resources in developing a robust advertising review program that includes both automated and manual review of ads." Perhaps we should all be a little wary of advertisements that come our way via Facebook, especially if they're offering a deal that sounds just a little too good.